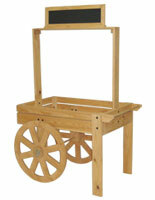 This wooden display cart is a great fixture for showcasing merchandise with character and style. 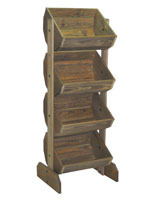 This fixture is ideal for country gift shops, flower stores and retailers looking to add a creative touch to their display. 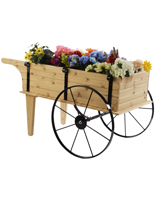 The 2 wheels have a 23" diameter to make the unit easily mobile, and also give it an authentic look. 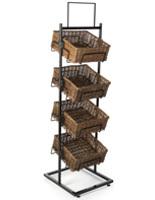 The full unit measures 42" long x 27" wide x 67.5" high. 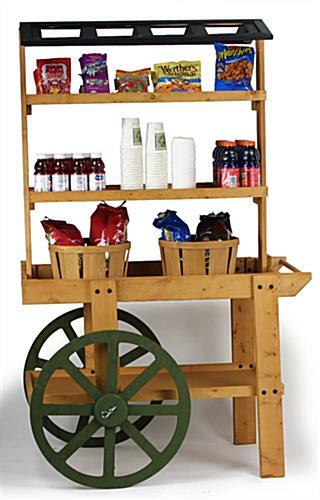 This display cart is constructed of oak stained spruce wood with a black roof and wheels. Spruce is a softer wood, and you will see imperfections such as knots or a slightly rough feel that give the display country charm. 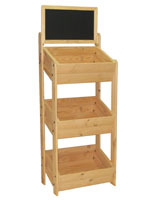 The spruce makes for a relatively lightweight yet sturdy display for your goods. 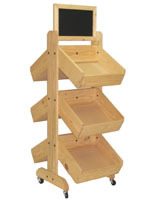 Assembly is required and hardware, instructions and an allen key are included. However, you will need your own flathead screwdriver to secure the roof. Assembly takes approximately 20-45 minutes. 42.0" x 67.5" x 27.0"
The axle was too big for the wheels, and did not fit the wheels. I had to break off pieces of wood from the wheel's center to make the whole big enough for the axle to fit, which was a time consuming task. 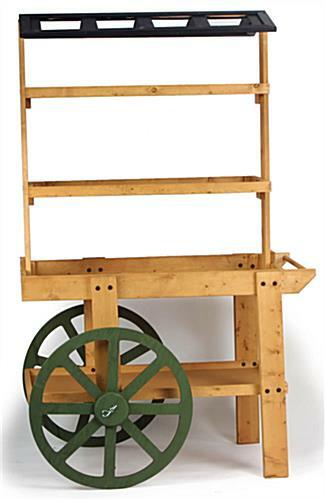 Additionally, we were unable to put the cart's top on the cart as there were no holes on top of the wooden sides for the top's screws to go into. You would have needed a drill to make this happen. Putting this together took almost two hours. We are sorry that your order was not the correct size, Meredith. A customer service representative will reach out to you shortly.